BRECKSVILLE, Ohio (CNS) — When Sister Anne McCrohan said goodbye to her parents and most of her 10 siblings at a train station in County Kerry, she thought it was forever. At age 18, Sister McCrohan had agreed to go to America to teach parochial school students. “I just had the desire to do something special with the life God gave me,” the 86-year-old Religious Sister of Mercy said of her youthful commitment. After World War II, American classrooms swelled with baby boomers. Desperate for English-speaking sisters, some bishops turned to Ireland for help. Sister McCrohan arrived in the Diocese of Sacramento, California, in 1949, but Irish Sisters of Mercy had been working there since 1857. For more than 100 years, none returned home. Sister McCrohan adapted to religious life, college and a new country — all at the same time. Because they lived with American and Mexican sisters, she and her four companions made an immediate adjustment. “We couldn’t talk Irish all day long and ignore everybody else,” Sister McCrohan said in a phone interview from Auburn, California. Four Irish-born pastors eventually urged the Mercy sisters’ superiors to permit home visits. Somehow the priests arranged for funds for four or five sisters to make the trip each summer. When Sister McCrohan’s turn came in 1963, she already had made final vows, graduated from college and become an American citizen. She fondly recalls her family’s first joyful reunion. Sister Fabian Quigley left Tipperary, Ireland, in 1949 as a 15-year old postulant of the Sisters of the Incarnate Word. Religious vocations were common in her family. “My father had four sisters as nuns and a brother a priest,” Sister Quigley said. In Cleveland, she graduated from an all-girls Catholic high school and started college. She didn’t struggle with homesickness because there were many other Irish sisters in the community. “What used to be a little more difficult was ‘visiting Sunday’ for the postulants and novices, when their families came and we had nobody coming,” she recalled. Sister Quigley received her first teaching assignment, a class of 65 sixth-graders, as soon as she completed two years of college. She then went to school on Saturdays and during the summer until she earned her degree. She was excused from work the day she and 11 other Sisters of the Incarnate Word became U.S. citizens. 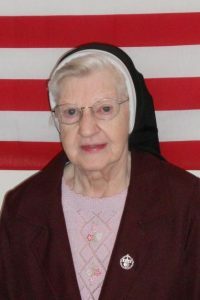 Sister Quigley rode the bus back to the convent, clutching her little American flag. She returned to Ireland nine years after her departure. Trips home became more frequent for Sister Quigley and other Irish sisters in later years. “Our community was absolutely wonderful to us,” she said. Loreto Sister Josephine O’Brien was a 31-year-old teacher when she and four other Loreto sisters arrived in Phoenix in 1954. They wore long serge habits, lived without air-conditioning and suffered in the hot weather. But Sister O’Brien remembers their happiness. When her students misbehaved, Sister O’Brien sometimes reprimanded them in Gaelic, a successful ploy to quiet them. She taught for two decades in Arizona and California before encountering a quirk of American culture when she transferred to the Chicago area. Another woman religious asked Sister O’Brien if she was a Cubs fan or a White Sox fan. Sister O’Brien was neither, and so the sister advised her to be a Sox fan like everyone else in the house. “And so I’m a Sox fan, even though I don’t know a thing about it,” Sister O’Brien said. She returned to County Offaly several times. Her doctor ruled out travel for health reasons 14 year ago. Six nephews and her brother, a missionary priest home on leave from Africa, came to America for her 60th jubilee. Now 95, Sister O’Brien misses the sisters who came to the States with her in 1954. “They have all gone to God,” she said. She spends St. Patrick’s Day listening to Irish music alone in her room.